It will encourage a wide variety of wild birds in to your garden for you to enjoy. The pitched roof will ensure food is kept dry and will provide a safe platform away from predators. Ideally locate near cover to be kept away from predators such as cats and birds of prey. Dimensions: 19cm (height) x 19.5cm (length) x 19.5cm (width). Made in the UK. This attractive Hanging Bird Table is ideal for the smaller garden or for use as a secondary feeding station. Fill the base with food and it will encourage a wide variety of wild birds into your garden for you to watch and also to provide a useful pest clearing service to your plants. 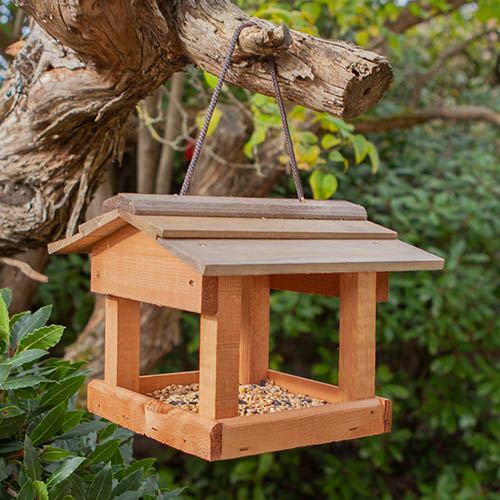 This delightful wooden feeder has a pitched roof which is decorative as well as functional, helping to keep food dry and also to provide a safe feeding platform away from predators. When positioning your feeder, ideally locate near cover make and sure that predators such as cats and birds of prey can't access it. Supplied as a hanging bird table dimensions: 19cm (height) x 19.5cm (length) x 19.5cm (width) Made in the UK.